Madison - Fornear Photo | Husband & Wife Wedding Photographers Traveling the Midwest & Beyond! On Wisconsin... Madison, home of the Wisconsin Badgers and Wisconsin's state capital! We love Madison Wisconsin from the thriving art scene, the college campus, music venues, food, culture, lakes to the craft breweries (including the annual beer fest Great Taste of the Midwest) we always have a blast photographing around Madison. 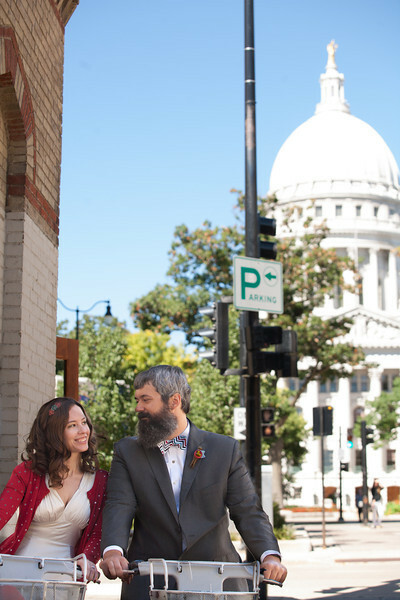 Have you seen the Offbeat Bride wedding we photographed for Cori & Kevin's Madison Capital Building wedding featuring the fun red bikes you can rent around the city!? Check it out here, we love working with offbeat couples! Some great wedding venues in Madison include the Madison Masonic Center, Goodman Center, Sheraton Madison Hotel, the Crowne Plaza Madison, the Edgewater Hotel, Porta Bella, the Mantova Room, Blackhawk Country Club, the Madison Concourse Hotel & Governors Club, Quivey's Grove, the Madison Club, Noah's Event Venue, the Brink Lounge and of course the Monona Terrace. Contact Fornear Photo today so we can be your Madison wedding photographer, family photography, portrait photography or event photography needs!